NOTE: EACH ITEM WE MANUFACTURE IS CUSTOM MANUFACTURED FROM SCRATCH AND EACH PIECE IS DIFFERENT AND UNIQUE IN ITS OWN WAY. PLEASE NOTE THAT ALTHOUGH WE TRY TO MAKE EACH ITEM "SIMILAR" TO THE PHOTOS SHOWN ON THE WEBSITE, NOT EVERY ITEM WILL "EXACTLY" MATCH THE ITEM IN THE PHOTO. THE BASIC DESIGN WILL BE THE SAME - BUT THE SHAPE, COLOR, AND SIZE OF THE ITEM MAY VARY. CHROME-PLATED CEREMONIAL BULLETS - GENUINE POPLAR AND CHROME. PRICE LISTED IS FOR EACH BULLET - NOT A SET. CLICK ON PHOTO FOR ADDITIONAL DETAILS AND PHOTOS. 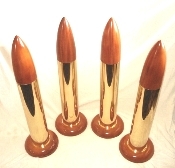 BRASS-PLATED CEREMONIAL BULLETS WITH BEAUTIFUL POPLAR TIPS AND BASES. PRICE LISTED IS FOR EACH BULLET - NOT A SET. CLICK ON PHOTO FOR ADDITIONAL DETAILS AND PHOTOS. CHROME-PLATED MAHOGANY CEREMONIAL BULLETS. PRICE LISTED IS FOR EACH BULLET - NOT A SET. TURKSHEADS ADDITIONAL. CLICK ON PHOTO FOR DETAILS AND PHOTOS. BRASS-PLATED SHELL WITH BEAUTIFUL EXOTIC MAHOGANY TIP AND BASE. PRICE LISTED IS FOR EACH BULLET - NOT A SET. CLICK ON PHOTO FOR ADDITIONAL DETAILS AND PHOTOS. CHROME-PLATED CEREMONIAL BULLETS WITH EXOTIC DARK WALNUT TIPS AND BASES. BRASS-PLATED CEREMONIAL BULLETS WITH EXOTIC DARK WALNUT TIPS AND BASES. CLICK ON PHOTO FOR ADDITIONAL DETAILS AND PHOTOS. SPECTACULAR UNIQUE OLDE-WORLD CANNONBALL STANCHIONS - THESE ARE THE EXACT SAME CANNONBALL STANCHIONS WE MANUFACTURED FOR USS CONSTITUTION. PRICE LISTED IS FOR EACH BULLET - NOT A SET. CLICK ON PHOTO FOR ADDITIONAL DETAILS AND PHOTOS. NEW CEREMONIAL BULLET AND MISSILE COVERS! THESE BEAUTIFUL WEATHER-RESISTANT COVERS COME WITH A SOFT FELT LINING AND A BOTTOM DRAWSTRING. NEW ITEM!! THE "KISBIT" SIMILAR TO THE "KISBIE" WHICH WE'VE BEEN MAKING FOR YEARS, BUT SMALLER AND MUCH EASIER TO STOW ABOARD SHIP. MADE FROM SOLID OAK. CHOOSE YOUR OWN 20" LIFERING AND LETTERING AT NO ADDITIONAL CHARGE. OLD STYLE NAVY KISBIE - OAK. INCLUDES PERSONALIZED LIFERING WITH SHIP/COMMAND NAME AND HOMEPORT. ALSO INCLUDES A GENUINE OLD-TIME SEAFARING BRASS LANTERN WITH COPPER ACCENTS AND A GLASS GLOBE. CLICK ON PHOTO FOR DETAILS! PORT AND STARBOARD LANTERN KISBIE STAND - SOLID MAHOGANY KISBIE WITH PORT AND STARBOARD BRASS AND COPPER LANTERNS AND A PERSONALIZED LIFERING. BEAUTIFUL RED CARPET ROLLS. ALL DIFFERENT SIZES AVAILABLE!! PERFECT FOR YOUR NEXT SPECIAL EVENT! CLICK ON PHOTO FOR DETAILS AND TO SELECT CARPET SIZE. OAK PODIUM WITH FLIP TOP LID AND SHELVES. SHIP OR COMMAND CRESTS AVAILABLE (SOLD SEPARATELY). CLICK ON PHOTO FOR DETAILS! MAHOGANY PODIUM - 48" X 24". SHIP OR COMMAND CRESTS AVAILABLE (SOLD SEPARATELY). CLICK ON PHOTO FOR DETAILS! 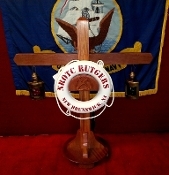 STUNNING MAHOGANY QUARTERDECK PODIUM - WITH CUTOUTS TO HOLD BINOCULARS AND RADIO. CLICK ON PHOTO FOR DETAILS! PODIUM - THE "MIDWAY" - BIRCH AND WALNUT PODIUM - THE "IWO JIMA"
BIRCH AND WALNUT PODIUM - APPROX. 48" X 24". CLICK ON PHOTO FOR DETAILS! BEAUTIFUL SOLID WOOD PODIUM WITH DURABLE WHEEL CASTERS. OAK, MAHOGANY, WALNUT, OR CHERRY. SELECT CHOICE OF WOOD BELOW. SHIP OR COMMAND CRESTS AVAILABLE. CLICK ON PHOTO FOR DETAILS! QUARTERDECK PHOTO BOARD - OAK, MAHOGANY, CHERRY, WALNUT OR OTHER TYPES OF HARDWOOD AVAILABLE. CLICK ON PHOTO FOR DETAILS. CUSTOM-MANUFACTURED - CALL OR E-MAIL FOR QUOTE. OAK, MAHOGANY, OR WALNUT. CUSTOM MANUFACTURED. CALL OR E-MAIL FOR PRICE QUOTE. CLICK ON PHOTO TO VIEW OTHER BOARDS. BELL STAND - A-FRAME - SOLID WOOD FOR MEDIUM AND LARGE BELLS BELL STAND - SOLID HARDWOOD - THE "ADMIRAL KINKAID"
SOLID WOOD A-FRAME STYLE BELL STAND - FOR MEDIUM AND LARGE SIZED BELLS (BELL NOT INCLUDED). SELECT WOOD CHOICE BELOW. OUT OF AREA COMMANDS PLEASE CALL 619-474-2002 / 619-474-2003 OR E-MAIL QUOTES@THEBOSNSLOCKER.COM FOR A SHIPPING QUOTE. SOLID WALNUT BELL STAND WITH FLIP TOP LID FOR BELL STOWAGE. CEREMONIAL 5 FOOT TALL SOLID HARDWOOD BELL STAND. CLICK ON PHOTO FOR DETAILS! BEAUTIFUL CEREMONIAL BELL STAND - DETAILED WITH A UNIQUE ORIENTAL FLAIR. HINGED DOOR TO STORE BELL OR POLISHING SUPPLIES. CLICK ON PHOTO FOR DETAILS. BELL STAND, SOLID HARDWOODS - "ADMIRAL NIMITZ" W/ DARK MAH STAIN BELL STAND, SOLID HARDWOOD - THE "ADMIRAL LEAHY"
BEAUTIFUL CEREMONIAL BELL STAND - DETAILED WITH DARK MAHOGANY STAIN. CLICK ON PHOTO FOR DETAILS. BEAUTIFUL CEREMONIAL BELL STAND - DETAILED WITH CLEAR FINISH. HINGED DOOR TO STORE BELL WHEN NOT IN USE. CLICK ON PHOTO FOR DETAILS. BELL STAND, SOLID HARDWOOD - THE "ADMIRAL KING" BELL STAND, SOLID HARDWOOD - THE "ADMIRAL SPRUANCE"
CEREMONIAL BELL STAND - DETAILED. CLICK ON PHOTO FOR DETAILS. FLAG STAND, BOX TYPE - THE "PANDORA" FLAG STAND, BOX TYPE - THE "POSEIDON"
BEAUTIFUL BOX TYPE FLAG STAND WITH DRAWER FOR FLAGS - SOLID QUALITY CONSTRUCTION. AVAILABLE IN OAK, MAHOGANY OR WALNUT. CLICK ON PHOTO FOR ADDITIONAL DETAILS AND PHOTOS. BEAUTIFUL BOX TYPE FLAG STAND - WEIGHTED STAND WITH SIDE HANDLES. SOLID QUALITY CONSTRUCTION. AVAILABLE IN OAK, MAHOGANY OR WALNUT. CLICK ON PHOTO FOR ADDITIONAL DETAILS AND PHOTOS. 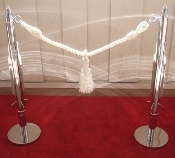 BEAUTIFUL SHIP'S WHEEL FLAG STAND - WEIGHTED WITH SIDE HANDLES. SOLID QUALITY CONSTRUCTION. OAK, MAHOGANY OR WALNUT. CLICK ON PHOTO FOR DETAILS. 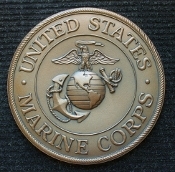 COMMANDING OFFICER'S NAME BOARD WITH SOLID BRASS COMMAND AT SEA INSIGNIA AND BRASS NAME TAGS. PLEASE CALL FOR PRICE QUOTE. 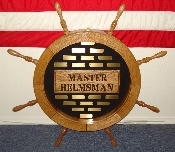 BEAUTIFUL MASTER HELMSMAN DISPLAY IN OAK. CLICK ON PHOTO FOR DESCRIPTION, ADDITIONAL PHOTOS AND CLOSE-UP VIEWS. 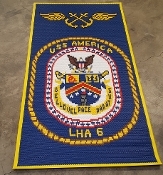 SURFACE WARFARE OFFICER'S BOARD W/ BRASS SWO INSIGNIA - OAK. CLICK ON PHOTO FOR DETAILED DESCRIPTION AND ADDITIONAL PHOTOS. BEAUTIFUL SOLID WALNUT MUG RACK WITH NAPKIN HOLDER. OUR DESIGN OR YOURS - WE CAN MAKE IT. BULLETS IN PHOTO NOT INCLUDED. CLICK ON PHOTO FOR DETAILS. SOLID WALNUT HAT RACK WITH SOLID BRASS HOOKS AND A BRASS OFFICER'S CREST. AVAILABLE IN OAK, WALNUT, OR MAHOGANY. MAKE WOOD SELECTION BELOW. TABLE - OAK WITH INDIVIDUAL EASY STOWABLE LEGS. CLICK ON PHOTO FOR ADDITIONAL PHOTOS AND DETAILED DESCRIPTION. 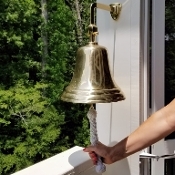 BEAUTIFUL SHIP'S BELL CAST IN BRASS AND POLISHED TO A BEAUTIFUL SHINE. 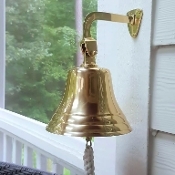 10 INCH SOLID BRASS SHIP'S BELL - POLISHED TO A BEAUTIFUL SHINE. 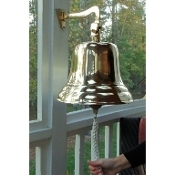 12 INCH SOLID BRASS SHIP'S BELL - POLISHED TO A BEAUTIFUL SHINE.